Summer is the time of year when so much seems to be happening ... weddings, family reunions, backyard barbeques and more! Most of us find ourselves outside during these rendezvous, so we came up with the perfect project to keep your evenings aglow after the sun goes down. 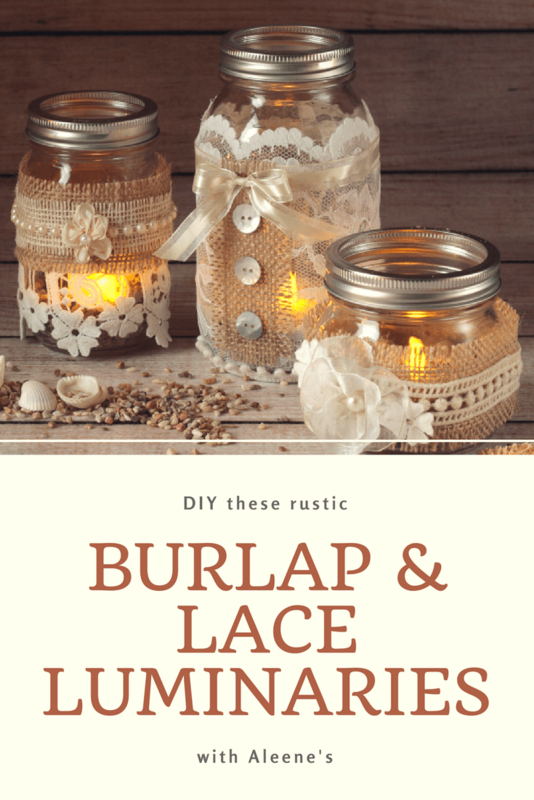 Covered in burlap and lace, these mason jar luminaries will create an ambiance of sweet sentiments whether you're at a wedding or relaxing in your backyard. After you've cleaned and dried the canning jars, cut a strip of burlap to fit around each. Once you are happy with the fit, add a thin strip of Ultimate Adhesive to the edge of burlap, let set 2 minutes and press in place. Cut lace to fit around jars, then add a thin line of adhesive to backside and allow to set for 2 minutes before wrapping in place around jars. Repeat glueing additional layers of lace and fabric, finishing with buttons and other embellisments as desired. Let dry 24 hours before using. Light up your night with beautiful lacy luminaries!